however large knowledge gaps remain. With this in mind Nature Seychelles with backing from the Norwegian Embassy and Airtel Seychelles launched the Seychelles Seabird Group. The aim is to develop a coordinated plan for the management of seabirds by supporting seabird group partners, providing training and co-ordinate surveys and research. The seabird colonies of the Seychelles have been greatly reduced; most islands supporting breeding colonies are now small, predator free or very remote islands. Many species have become greatly reduced in range and at least two, the Pink backed pelican and Abbots Booby are extinct in the Seychelles. In the past heavy exploitation for food and the destruction of islands for plantations or guano mining caused loss of colonies. Today the main threats are uncontrolled exploitation and the introduction of alien predators to islands. The potential effects of fisheries and climate change on the marine environment are not known. 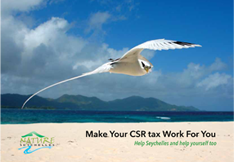 The overall goal of the group is to facilitate the sustainable management of seabird resources in the Seychelles. Maintain the Seychelles seabird database. A Seabird Monitoring Handbook for Seychelles has been produced; it contains recommended survey methods for the 18 species of seabird found breeding the Seychelles.